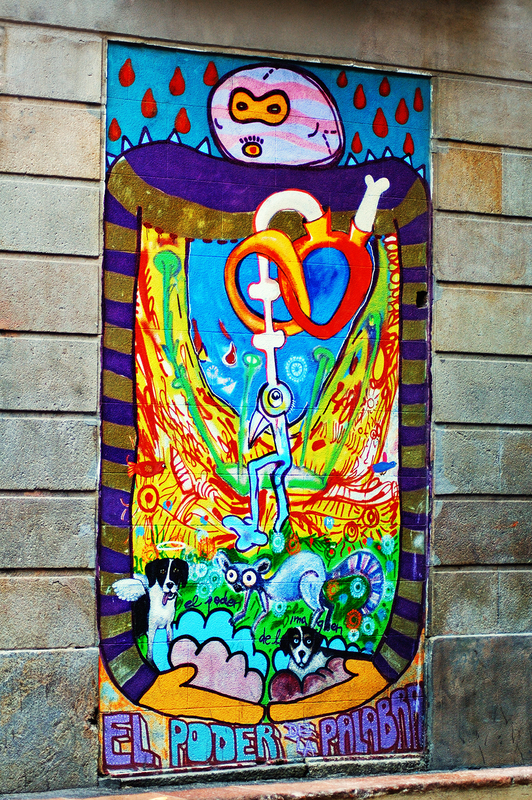 This is some flashy wall mural I found in the Raval area. I don't know exactly what it means although it talks about the power of images and words. The casc antic area (old town) is full of them. Carlos great capture these colours on the mural are great it is so colourful great work !!!! I love it! The colours make me smile, though it is hard to find a meaning! Wow, that's a lot to take in! Makes me want to interview the artist. Someone took a great deal of trouble doing this. It is fantastic. You know, there is so much talent around us. You only need to go to U Tube to find them. There is a great cartoonist on there with enormous talent who obviously couldn't get anywhere like so many of us. Those who are in power often don't see the potential of capable artists, writers etc. The little town where I live has many, many murals painted on the buildings. These have been done by commissioned local artists and the citizens love them! I wish I could magically make this mural you show come onto one of the walls in my downtown! It's beautiful and I love the texture of the wall, too. The mural leaps from the wall. Beautifully captured. do u remember a name of the street?? It was at Plaça Traginers in the Gothic quarter near Via Laietana. In the post I said El Raval and that is wrong. Sorry folks.